In our final story, Paul McGann stars in his only outing as the eight Doctor in Doctor Who: The Movie. Returning home to Gallifrey with the remains of his arch enemy, the Master, the TARDIS is forced off course, landing the Doctor into the middle of a street gang's gun battle in downtown San Franciso. 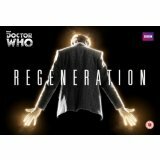 Critically wounded in the shoot out, the Doctor has to regenerate to save his own life. And he's not the only one - the Master too has a new body with which to wreak havoc. As the clock counts down to the start of a new millennium, the Doctor has to stop the Master destroying all life on Earth. But at what cost...? Paul McGann has reprised his Doctor Who role for a special mini-episode. 'The Night of the Doctor' sees McGann reprise his role as the eighth Doctor on-screen for the first time since 1996 - marking only his second screen appearance in the role. The short - which runs just under seven minutes - finally reveals how this incarnation of the Time Lord met his end and also confirms that John Hurt's Doctor follows directly on from McGann's version. Full of nods to Doctor Who fans, 'The Night of the Doctor' also reintroduces The Sisterhood of Karn from 1976 serial 'The Brain of Morbius' and features references to the eighth Doctor's adventures.